Abram rescued Lot and paid a tithe to Melchizedek. The LORD came to him in a vision. He believed the Lord, and it was credited to him as righteousness. “After this” refers to the time following the rescue of Lot by Abram, and Abram subsequently paying a tithe to Melchizedek. Abram knew that his success and victory over the kings of Mesopotamia were from the LORD and not by his own hand. Abram declared to the king of Sodom that he would not accept anything belonging to the king, not even a thread or the thong of a sandal. Abram had a great victory and gave a tithe to Melchizedek who was the king of Salem and a priest of God Most High. After Abram publically acknowledged that his success and blessings were from God and not from man, the LORD came to him in a vision. The word of Yahweh, the Self-existent One, appeared to Abram while he was awake and in a temporary trance (he had a vision) and called him by name. The vision may have been a pre-incarnate appearance of Jesus who is the Word of God, or the LORD manifested himself by speech to his servant Abram. The vision must have manifested the glory of God because the LORD assured Abram not to be afraid. Abram may also have feared that the four Kings of Mesopotamia, who he had recently defeated, may return with an even greater force. But the LORD then promised that not only will He be Abram’s shield – his protector and defender – but also his very great reward. Abram had received a great victory over the kings of Mesopotamia and had already accumulated a great number of flocks, herds and servants. Yet, despite the blessings and honors that Abram had already received from the Lord, he remained childless. Would all of his material possessions be inherited by his eldest servant and the steward of his house, Eliezer? How would all the peoples of the earth be blessed through Abram, if the promised seed of the woman – the Messiah – did not physically descend through Abram who was in the line of Shem? 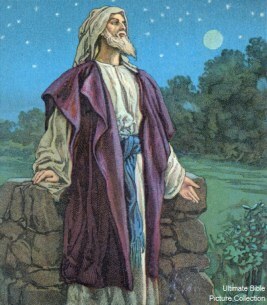 The LORD not only reassured Abram that he would indeed have a son coming from his own body who would be his rightful heir, but that Abram’s offspring would be as innumerable as the stars in the sky. Chapter 22 of the Book of Genesis records the account of Abraham’s faith being tested when the LORD tells him to offer up his son Isaac as a sacrifice. Abraham responds positively to God's command to sacrifice his son, and God responds to Abraham by reiterating His promises and blessings to Abraham and his descendants. Not only does God speak of Abrahams descendants as numerous as the stars but also as countless as the grains of sand on the seashore. These two elements not only depict countless numbers but also are symbolic of two types of offspring. The sun has one kind of splendor, the moon another and the stars another; and star differs from star in splendor. So will it be with the resurrection of the dead. The body that is sown is perishable, it is raised imperishable; it is sown in dishonor, it is raised in glory; it is sown in weakness, it is raised in power; it is sown a natural body, it is raised a spiritual body. God would later rename Abram which means, “Exalted Father,” and give him the name, Abraham which means “Father of Many.” He would be the patriarch of numerous natural children. “As the sand of the seashore” is a phrase alluding to the first Adam who was of the dust of the earth – the natural man who had a natural body. The children of Israel are the physical seed of Abraham. The stars are a picture of those who would belong to Christ, having been purchased by the blood of Jesus. Abraham’s spiritual seed are those who place their trust in the finished work of Christ on the cross. They are heirs according to the promise. As the adopted children of God, they are heirs of God. Being the spiritual children of Abraham by faith, they also receive the blessings and promises. Abraham is the father of us all. He is the father of both the natural children (like the sand on the seashore) and the spiritual children (as the stars in the heavens). Abraham is the patriarch of the Hebrews and Arabs. He is also the spiritual father of those, like him, who have been credited as righteous by faith in God’s promised Messiah. The LORD God’s purpose for calling Abram out of Ur of the Chaldeans was to give him the land of Israel as his and his children’s possession. God's gifts and calling are not taken back. God gave Abram and his descendants the land as their possession. It is a gift from God. God’s gifts are irrevocable. The natural land still belongs to the physical seed of Abraham. Abram had believed God’s promise that he would have an heir from his own body and numerous offspring. Abram was declared righteous because of his faith. Yet, Abram asked for a sign that he would possess the Land of Canaan. The LORD did not rebuke Abram for asking for a sign, but had him gather animals to be used in order to cut a covenant with him. A covenant is a contract or agreement between two parties. The animals chosen for the “cutting of the covenant” were ceremonially clean animals and birds. They foreshadowed the ceremonial sacrifices that would later be offered up for sin under the Mosaic Law. According to Leviticus 1:17, when a dove or young pigeon was to be offered as a burnt offering it was not to be severed completely. The heifer (female cow) brought to the LORD by Abram foreshadowed purification and cleansing from sin for individuals. The goat that was brought to the LORD by Abram foreshadowed purification and cleansing from sin for the entire community of Israel. 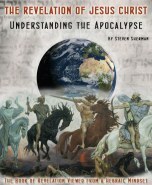 All Israel will be saved, but only those who survive through the Great Tribulation. On the Day of Atonement, Jesus will return to the earth to redeem Israel. The sins of the nation including wickedness and rebellion will be taken away. On that day, ungodliness will be removed from Jacob. In the future, a ram would be very significant in Abram’s life and in the life of the promised heir from his own body. The ram that was brought to the LORD by Abram foreshadowed the substitutionary sacrifice of the Son of God. For on that same mountain, God himself would provide His only begotten Son, the Lamb of God that takes away the sin of the world (John 1:29). In Scripture, birds sometimes represent satanic activity. In the parable of the sower, the Lord Himself explained that the birds which ate the seed represented the action of Satan: “Some people are like the seed along the path, where the word is sown. As soon as they hear it, Satan comes and takes away the word that was sown in them” (Mark 4:15). 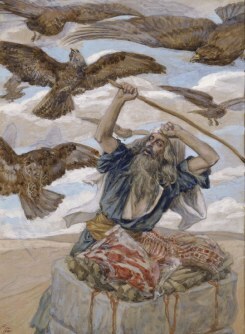 The birds of prey in Genesis 15 may be another spiritual picture of satanic activity. These unclean birds attempted to tear and devour the sacrificial animals, the visible part of the sacred covenant-confirming ceremony. They had to be driven away. While God could have prevented the birds from disturbing the ceremony, or driven the vultures away Himself, He gave Abraham the responsibility to care for the visible signs of the covenant. After a day of preparation which included gathering and slaughtering of the prescribed sacrificial animals, Abram fell into a deep sleep. The thick and dreadful darkness symbolized the spiritual darkness and physical suffering that his descendants would endure as slaves in Egypt. Indeed in the fourth generation, after the life spans of Abraham, Isaac and Jacob, the sons of Israel would emerge with great possessions, return to Canaan and the nation they served would be severely punished. One of the purposes of the delay in the deliverance of the Hebrews from Egypt was to allow for the sin of the Amorites to reach its full measure. The LORD didn’t immediately pour out his wrath on this nation, but allowed hundreds of years to pass in which the Amorites could have repented from their wickedness.The term Amorites as used in the Bible is sometimes interchangeable with Canaanite. At other times Canaanite is more general, and Amorite is a specific group among the Canaanites. The more specific use refers to highland mountaineers who inhabited the land of eastern Canaan, described in Genesis 10:16 as descendants of Canaan, son of Ham. After the Hebrews emerged as the nation of Israel from Egypt, God was going to mete out judgment upon the Amorites through Joshua and his army.